Gameplay and field positions in Gaelic games is a fluid and dynamic affair. For every positional ‘rule’ there are a handful of exceptions. It is likely better to think of the positions in terms of general guidelines. As the game evolves, things like player fatigue, turf conditions, weather, even the scoreline can have an effect on gameplay. Keep in mind that this numbering scheme is traditional/typical of how it is done in Ireland. Generally, American players use an arbitrary numbering scheme and play 13 a side. Either way, knowing the names and relative positions will go a long way. Now that we have a frame of reference, we can look at individual positions, who should fill them, and what successful play looks like. The role of a goalkeeper is similar to other codes; to prevent the ball from entering the goal. The goalkeeper in Gaelic football and hurling also usually has the role of kicking or pucking the ball out to the outfield players. A good goalkeeper most often has great agility and bravery as well as strength and height. In Gaelic football a keeper’s shot stopping ability is of great importance. There is no limit to where on the field the goalkeeper can travel, although once they are outside of the penalty area, they are subject to the same rules as all other players. A goalkeeper in men’s football may touch a grounded ball (with his hands) inside his own penalty area, and is the only player permitted to do so. It is not permitted to physically challenge a goalkeeper while inside his own small parallelogram, but players may harass him into playing a bad pass, or block an attempted pass. The substitute goalkeeper usually wears the number 16 jersey and the third choice goalkeeper usually wears the number 31 jersey. The role of the right and left Corner Back is to defend against opposing attackers – in particular the left and right corner forwards. They will play most around the 20-meter line. The positions require the players having decent speed over short bursts and good hand eye co-ordination. Endurance and strength are unnecessary, although agility is required. The role of full back is one of the most important in Gaelic football or hurling. As well as defending against attackers, the Full Back is responsible for organizing the defense and is the key defender in front of goals, and is usually one of the tallest and strongest players on the team. The full back plays most often around the 20-meter line. The position of the full back requires that the player have decent speed over short bursts, strength, and good hand eye co-ordination. In playing either cornerback or full back positions a well-developed aerobic system is required although, unlike the corner backs, the full back is needed to make short burst sprints both away from and into the goal area. The role of the half backs is less defensive than that of the corner backs. The half backs operate most often in between the 45-metre line and the midfield. 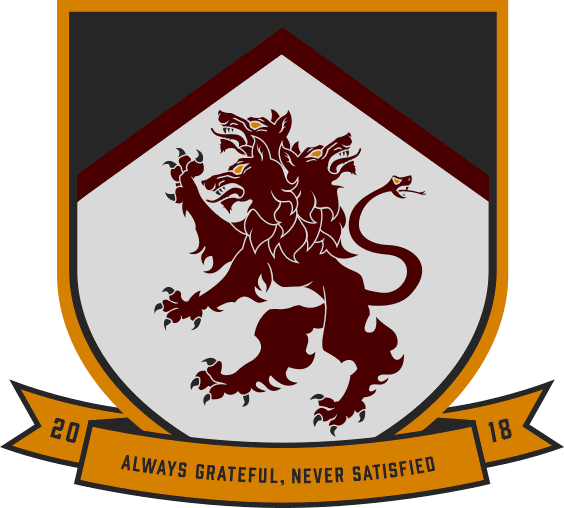 The half backs are expected to defend against the opposition’s half forward line but also has a responsibility to make runs from their own 45-meter line to advance the play to the half forward and full forward lines. The role of the center half back is less defensive than that of the full back. The center back operates from the 45-meter line and forward to the midfield. A center back will help win the breaking ball in the midfield and can be used as a third midfielder. 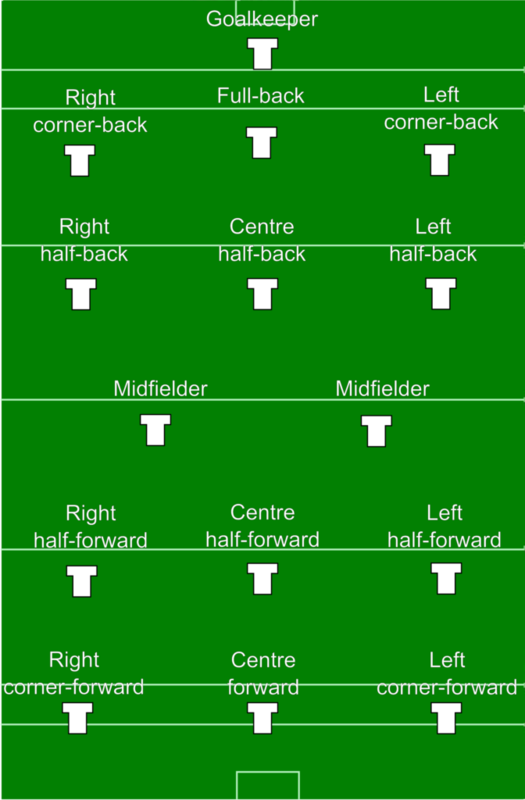 The center half back generally marks the center half forward. The required abilities of a center half back are strength, height, speed and a good catching game. The role of the midfield is to catch kick outs / puck outs from either team’s goalkeeper, and to act as the main link between the defending and attacking sections of the team. Midfield is often described as the most important role on the pitch. If the opposing goalkeeper is kicking the ball to the middle of the field, the midfielder has the responsibility to retrieve the ball. This prevents the opposing team from taking advantage and bringing the ball forward. The midfielder must then get the ball moving forward to the half forward and full forward lines. The position requires the player to have strength, height, speed, good catching ability, a good kicking game and, most importantly, endurance. It is important for the midfield to have a good understanding of their goalkeeper. They must anticipate where their goalkeeper will place the ball and therefore take advantage and bring the ball forward. Note that there is rarely a “left midfielder” and “right midfielder” – both play ‘off’ each other as a combined unit. If one midfielder is attacking, the other always goes up the field with him in support. Both midfielders always attack or defend at the same time. The role of the right and left half forward is to build up attacks and to feed the ball to the full forward line. They should take shots on goal or above the bar when opportunities are presented. The half forwards will cover a lot of ground and utilizing speedy half forwards to run at defenses is a common tactic. They operate from the midfield to the opposition’s 45 meter line. The role of the center half forward is to build up attacks and feed the ball to the full forward line. The center half forward is responsible for taking shots on goal and points when opportunities present themselves. A center forward also helps win breaking ball in the midfield, helping to win the possession to bring the ball forward. The center forward operates from the midfield to the opposition’s 45-meter line. The role of the right corner forward is to score points and goals. The entire full forward line operates around the opposition’s 21-meter line. They are generally ‘left-footed’ players. It is common for teams to employ a tall full forward to pluck high balls from the sky and to challenge the size and strength of the full back. The role of the left corner forward is to watch the full forward’s breaks and to score as many points and goals as possible. Like the full forward, they operate around the opposition’s 21-meter line. They are generally ‘right-footed’ players. These guidelines brush the surface of gameplay options and strategy. As previously mentioned however, the above is a foundation and a critical point of understanding.